The number of open, unfilled construction sector positions increased in November and was revised up for October. According to the BLS Job Openings and Labor Turnover Survey (JOLTS) and NAHB analysis, the number of open construction sector jobs for November (on a seasonally adjusted basis) rose to 145,000. The November level marks the 3rd highest total of unfilled jobs in construction during the post-recession period. On a three-month moving average basis, the open position rate for the construction sector increased to 2.13% in November. 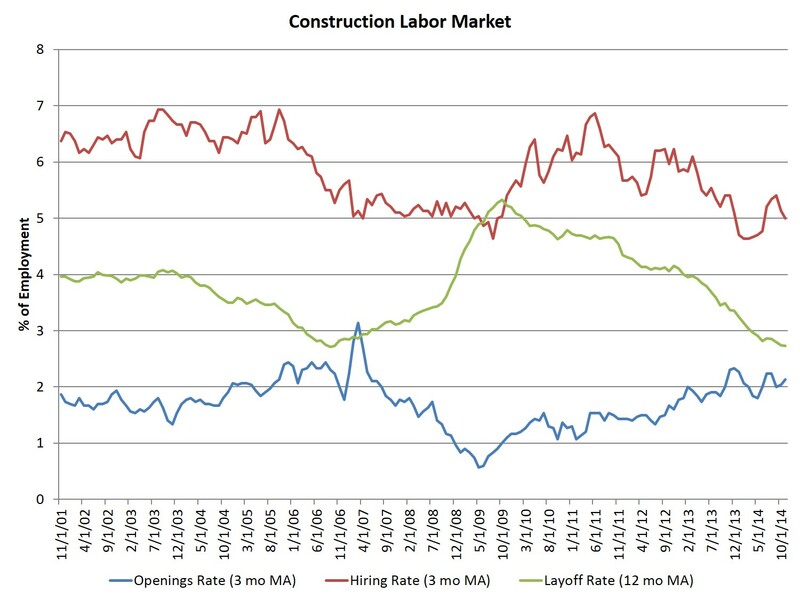 Over the last year, the open construction jobs rate has typically been higher than the rates that were experienced during the 2001-2003 period prior to the building boom. The sector hiring rate, as measured on a three-month moving average basis, declined in November to 5%, after a significant rise during the summer. 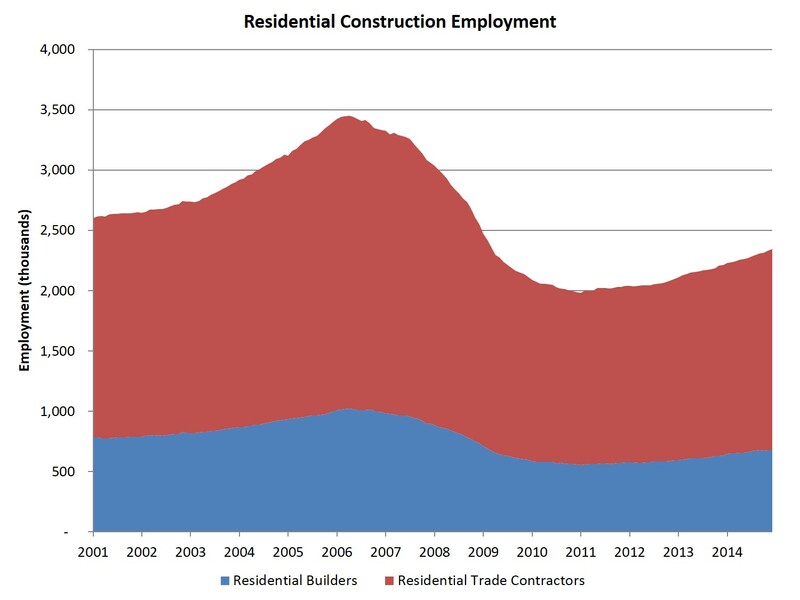 Monthly employment data for December 2014 (the employment count data from the BLS establishment survey are published one month ahead of the JOLTS data) indicate that total employment in home building/remodeling stands at 2.343 million, broken down as 677,000 builders and 1.666 million residential specialty trade contractors. In December, home builders and remodelers added 13,500 jobs to the residential construction sector on a seasonally adjusted basis. Over the last 12 months, the industry has created 132,000 jobs. Since the low point of industry employment following the Great Recession, the residential construction industry has gained 359,500 positions, although employment remains 1.107 million lower than the peak level seen in early 2006. Employment growth for the sector has been steady recently, adding on average just a little more than 12,000 jobs per month over the last six months. In December, the unemployment rate for construction workers declined to 7.5%. The unemployment rate for the construction occupation has been on the decline since reaching a peak rate of 22% in February 2010. For the economy as a whole, the November JOLTS data indicate that the hiring rate declined slightly, after revisions, to 3.6% of total employment. The hiring rate had been in the 3.1% to 3.5% range since January 2011 but rose above 3.5% for the first time in September. The overall job openings rate ticked up to 3.4%, matching the highest rate of open jobs for the overall labor market since 2007 (3.4%).